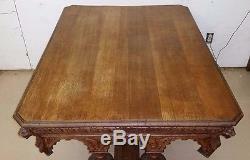 Offered for sale is a French antique oak table or desk measuring H 29" x W 51" x D 39. 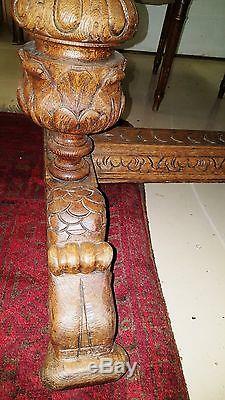 This Renaissance style antique was made in the 1800's in France with ornate dolphin feet. 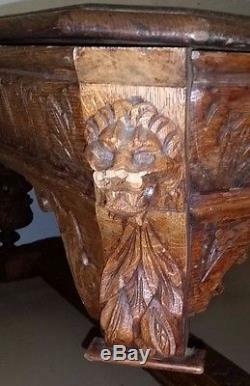 All sides have detailed carving with relief carved lion masks on the canted corners. Drop finials and arches make this a statement piece in any room or office. With 16,000 sq ft, the Antique Attic is the largest privately owned antique shop in Alabama. Visit us in Dothan, AL or virtually at AntiqueAtticDothan dot com. We are a third generation antique business waiting to share our knowledge and treasures with you! 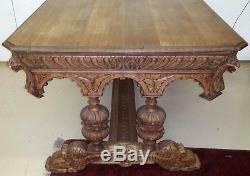 The item "Antique FRENCH Carved Tiger Oak Dolphin Table Desk Jacobean Gothic 1800's" is in sale since Saturday, September 15, 2018. This item is in the category "Antiques\Furniture\Tables\1800-1899". The seller is "antiqueatticdothan" and is located in Dothan, Alabama. This item can be shipped to United States.